Wayne Embry shares stories about his career at the 2013 Ceremony. 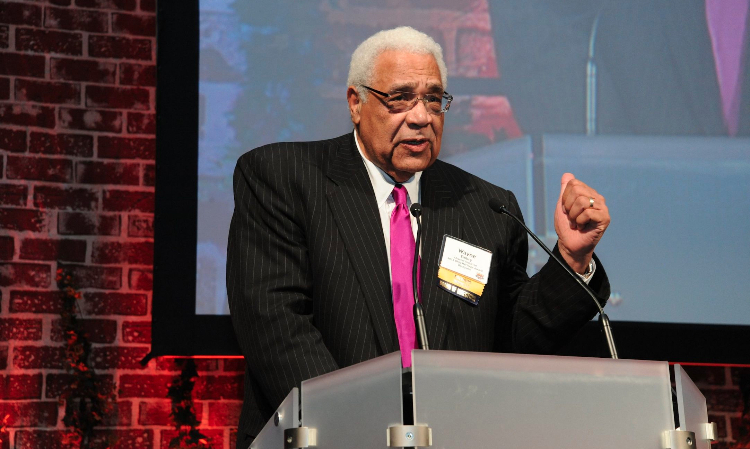 Wayne Embry, a member of the 2006 charter class of the Ohio Basketball Hall of Fame, received the second annual Ohio Heritage Award at the 2013 induction ceremony on May 18 at the Greater Columbus Convention Center. A native of Springfield, Embry had an outstanding career at Miami University. His 11-year NBA playing career included five appearances at the NBA All-Star game with the Cincinnati Royals, a world championship with the 1968 Celtics, and leadership of the expansion Milwaukee Bucks in the team’s first season in 1969. He moved into the front office as assistant to the president a year later, When the Bucks named him GM in 1974, Embry became the first African American to hold that position in any professional sports team. Following his 15-year front office tenure with the Bucks, and a year as a consultant with the Pacers, Embry became VP and GM of the Cleveland Cavaliers in 1986. When he was promoted to the presidency of the team in 1994, he again broke ground as the first African-American president of any professional sports team. In his 15 years with the Cavaliers, he was twice honored as NBA Executive of the Year. For the past eleven years, he has served as a senior advisor to the Toronto Raptors. In addition to his 50+-year NBA career, Embry has been a founder and CEO of his own businesses, a member of numerous corporate and nonprofit boards, and a community activist and mentor for youth in every city where he has lived, shaping and developing opportunities for literally thousands of people. He is also the author of an autobiography, The Inside Game: Race, Power and Politics in the NBA (University of Akron Press, 2004), with Mary Schmitt Boyer of the Cleveland Plain Dealer. Embry has been a trustee of the Naismith Memorial Basketball Hall of Fame since 1974. In recognition of his career both on the court and in the front office, he was inducted into the Naismith Hall of Fame as a contributor to the sport in 1999.